Read or listen a book? What kind of books are good as audiobook? You want to read a book or listen a book? Why you would choose one over another? 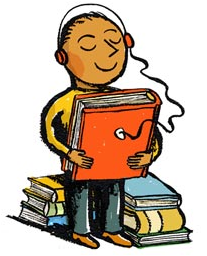 I was looking for an answer to this question: What kind of books are good as audiobook? I am not able to get clear answer. I still got one which say what types of books are not great audiobook? In my experience, book that reference graph, data and visual elements cannot be a great audiobook. I personally experienced a book that possibly had lots of table to reference data on that. Books that teach and talk about finance or stock selection can not be a great audiobook. You can get the gist of the book but reading wont be very fulfilling. I experienced that. I paid good amount for audio book and satisfaction was very bad then this question that resulted in this blog post arise. Visual books cannot be great audiobook is also correct. This I took from here. Books that talk about visuals or need to show visuals to convince it readers are books like garden, animal, types of flowers etc need superb visuals to show what they mean by certain items cannot be a great audiobooks. I mean to tell you that be careful while paying for audiobooks. Don't think that you can easily go through those kind of books and get all information.The experience will be very unsatisfying. Here it is mentioned that subjects that are complex can be difficult to grasp through audio books. It tells that on paper book, we can go through back and forth easily on paper book to comprehend the subject if we find it tough to grasp any point. Voice can help us grasp emotions of the subject. So, if book need to convey emotions then book can be good as audiobook. That’s because an audio book pre-determines an aspect of language called prosody, or the musicality of words.